Place butter in a heavy 2 quart saucepan and heat on medium until butter melts. Reduce heat to low and continue to cook until butter boils, stirring so as to prevent burning. The butter will foam and sputter while it cooks and separates into 3 layers; whitish curds (milk solids) will begin to form on the bottom of the pan, a clear, golden oil will be sandwiched in the middle and whey proteins will float to the top of the pan. Keep a close watch on the ghee, as it can easily burn. Once butter becomes a clear, golden color, use a clean dry spoon to remove some of the foam in order to see if the ghee is clear all the way to the bottom of the pan. When oil is clear and no longer sputtering, remove pan from heat. Let it cool until just warm. Pour butter through a fine sieve or sieve lined with layers of cheesecloth into a clean, dry glass container with a tight fitting lid. Discard the curds at the bottom and foam from the top of the saucepan. The ghee is burned if it has a nutty smell and is slightly brown (it is still useable for recipes calling for browned butter— it will add a nutty taste). A pound of butter takes about 15 minutes of cooking time; increasing the amount of butter will increase the time needed to form ghee. 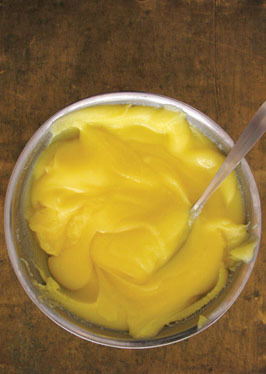 Ghee is a beautiful golden oil, free of milk solids and water with many uses. A clarified butter that originates in the Indian subcontinent, it is important to Indian cuisine, religious rituals and alternative medicine. Unlike butter, ghee can be stored for extended periods without refrigeration as long as it is kept in an airtight container to prevent oxidation and remains moisture free. Because the milk solids have been removed, ghee has a higher smoke point and is less likely to burn while cooking. As it’s also water free, it’s ideal for baking up flakey and crisp pastry dough.